May 27th might feel like any other Spring day to many but to Manchester United supporters like myself... it's one of the most important, stressful & exciting days of the year. The Champions League final - today in Rome. Manchester United (bless!) v. Barcelona. The best in Europe going head-to-head. Hoping, wishing, turning inside out in anticipation.... for more scenes like this one. 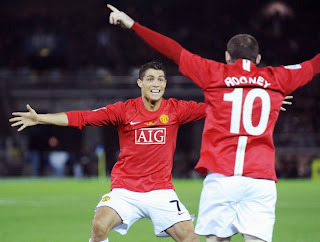 Over to you, Ronaldo & Rooney!